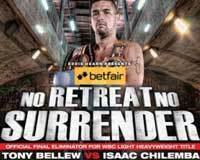 Review: 2013-03-30, close fight but not so exciting: Tony Bellew vs Isaac Chilemba gets two stars. Tony Bellew (19-1-0) entered as the No.5 light heavyweight in the world while Isaac Chilemba (20-1-1) entered as the No.9. Bellew vs Chilemba is valid for the WBC Silver light heavyweight title. Watch the video!